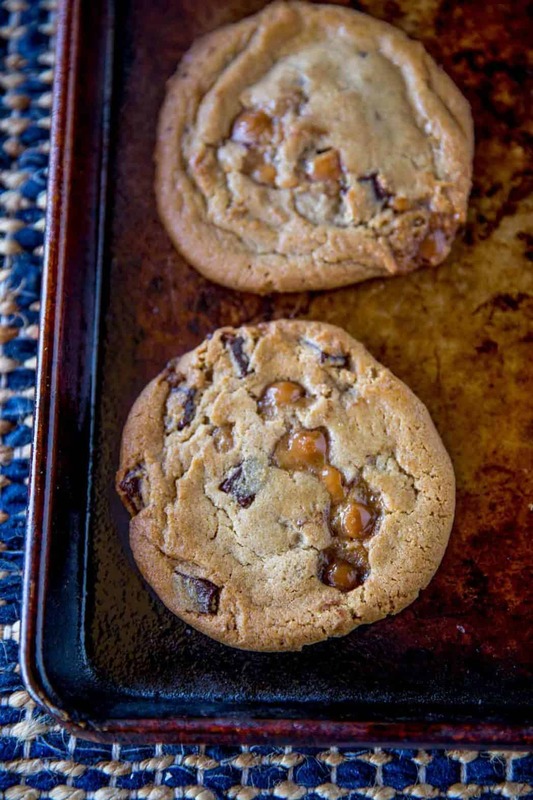 These caramel chocolate chip cookies are like the best of my Salted Caramel Brownies and my perfect Chocolate Chip Cookies in one cookie, one delicious salty and sweet cookie. 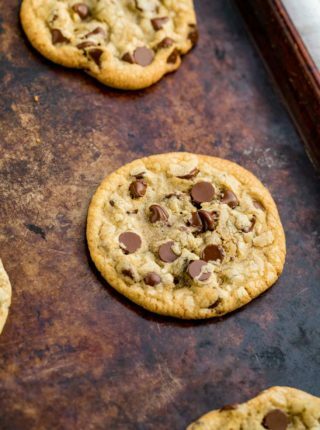 Chocolate Chip cookies are the most popular cookie recipe on the site. 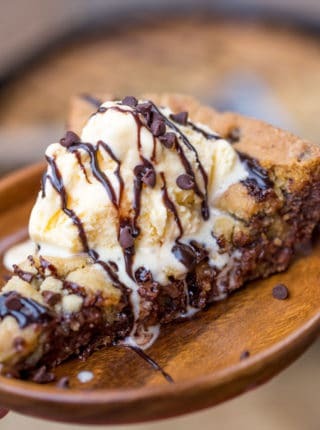 But this Caramel Chocolate Chip Cookie Recipe is actually even better than that recipe by about 10x, easy to make and if you try it, it will be your new favorite. 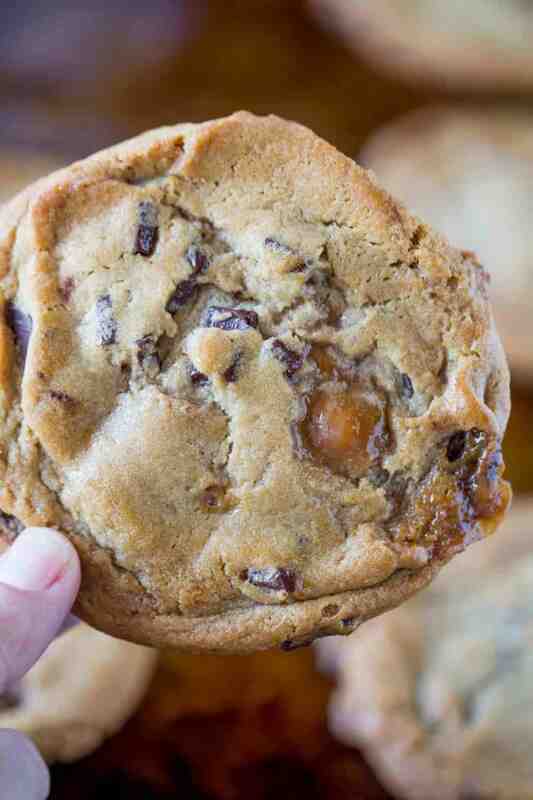 The chunks vs. the chips, the melted caramel puddles in the cookies, the amazing chew of the cookies with the brown sugar and the finishing touch of salt that rounds out the flavors of this yummy cookie. 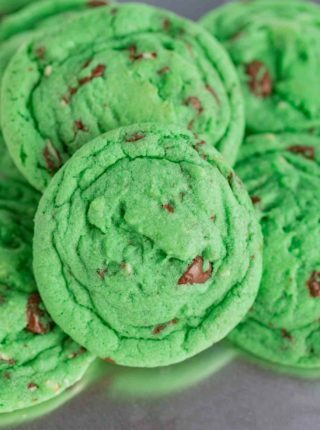 Next time make these into Salted Caramel Chocolate Chip Cookies by adding additional finishing sea salt on them in addition to the salted butter. 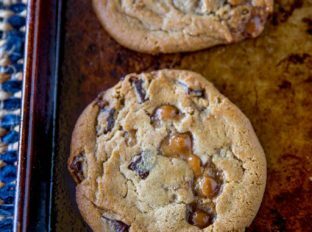 I love baking these cookies on a baking sheet with a silicone mat instead of parchment paper because of the caramel bits. Once they melt you’ll find they stick to parchment paper. I use the Kraft brand caramel bits but you can use any brand you’d like. Just be sure you are using bits instead of chews that you cut up. If you use chews they will burn while cooking. Cookies should be stored at room temperature in an airtight container. They will stay good for about up to 1 week before the caramel bits harden too much. Can you freeze Caramel Chocolate Chip Cookies? You can freeze cookie dough to pull out of the oven at any time! You can roll the cookie dough into a log and cover tightly with plastic wrap, or freeze the scooped out balls on a baking sheet, freeze them then store them in a large ziplock bag for later. 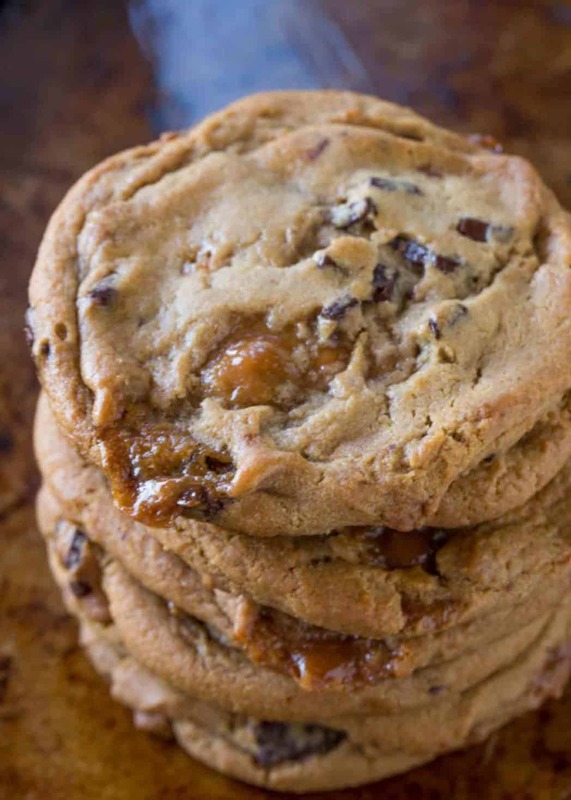 You can also freeze already-baked Caramel Chocolate Chip Cookies. Just wait until they are completely cooled, then layer them in an airtight container between layers of parchment or wax paper. They will last for about 3 months. You can also reheat them at 250 degrees in the oven until the caramel and chocolate just start to soften. Make sure to only mix in the dry ingredients until just combined. Preheat oven to 350 degrees. and sift together the flour, baking soda and salt in a large bowl. 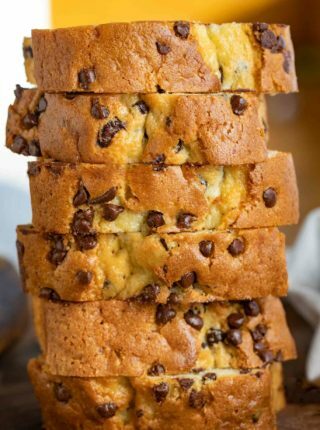 In a stand mixer beat the brown sugar, butter, and sugar until lightened and creamy, 2-3 minutes then add in the eggs and vanilla until fully combined. Add in the flour mixture until just combined then fold in the chocolate and caramel chips. Scoop in 2 tablespoon sized balls on a cookie sheet and bake for 13-15 minutes until golden brown. Oh em gee!!! You had me at caramel. I need these cookies in my life RIGHT NOW! They look and sound amazing! This cookies look fabulous. I love the sweet and salty combination and the addition of caramel. Yum. These are perfect! My kids loved them! The combination of caramel and chocolate is the best. So delicious cookies.